The purpose of this article is to report the findings of a study the aim of which was to examine the potential effectiveness of visual input enhancement in teaching embedded questions. According to Sharwood Smith (1991, 1993, 1994), and in line with the tenets of the Noticing Hypothesis put forward by Schmidt (1990, 1995), augmenting the “noticeability” of input, for example by means of underlining or capitalizing certain language forms, increases the chance of its being turned into intake. The research project took the form of a quasi-experimental study with a pretest-posttest design. The members of the experimental group were exposed to three treatment sessions during which the subjects read three texts in which the targeted structure was made salient by means of using three typographical cues, namely a different type of font, a different size of font, and boldfacing (an elaborate, non-explicit strategy (Sharwood Smith 1991). The students in the control group read the same texts, but the structure in focus was not highlighted in any way. The data-collection instruments enabled the researcher to measure the students’ implicit and explicit knowledge operationalised in terms of both production and reception. Despite being rather inconclusive, the results of the study suggest, among other things, that using textual enhancement is more likely to exert facilitative effects on implicit rather than explicit knowledge. Also, they raise numerous questions concerning the application of this kind of attention-drawing technique. Park, E. S. 2004. Constraints of implicit focus on form: Insights from a study of input enhancement. 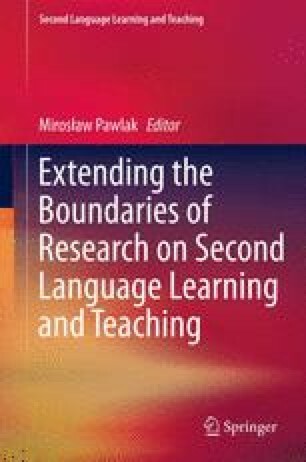 Teachers College, Columbia University Working Papers in TESOL and Applied Linguistics 42. (http://www.tc.edu/tesolalwebjournal/Park.pdf).